Patients with diabetes mellitus (DM) are more likely than patients without diabetes to undergo surgery and may be at higher than average risk to suffer perioperative complications, usually because of frequent concomitant cardiovascular disease (CVD). The manifestations of CVD in patients with diabetes are often atypical, making identification and management more difficult (1,2). The role of the physician asked to provide preoperative consultation is to work with the surgical team in assessing and reducing the risk of complications in the perioperative period, and to identify opportunities to make a favorable impact on long-term health. 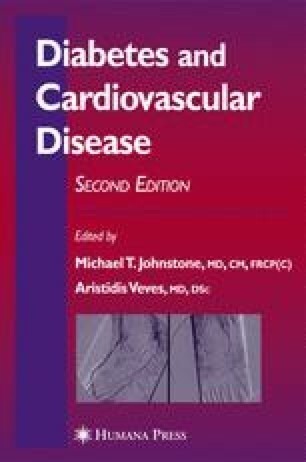 In caring for the patient with diabetes perioperatively, heightened awareness of the higher incidence of coronary artery disease (CAD), silent ischemia, and increased predisposition to postoperative complications of infection, hyperglycemia, and hypoglycemia is necessary to permit the best outcomes to occur. National Center for Health Statistics. Available from http://www.cdc.gov/nchs/fastats/insurg.htm. Accessed July 17, 2003.